As a kit house, you'd think there'd be a few examples "out there". Know of any other Prairie kit or pattern book designs? Sears offered two models in 1918, anybody recognize these? Apparently none were sold, or the locations would be noted on the page. Hi, I can't think of a good Prairie style example from the plan books I've seen. I don't think they sold well. The Gordon-Van Tine kit house number 2617 was only built once (at least that we know of to date). 605 East Washington St. Eustis, FL. The Sears Aurora and Carlton kit houses were plans licensed from John Van Bergen and offered one year by Sears (1918). (Thanks for the link, SDR!) One Aurora was located at 6416 Grand Vista Ave Cincinnati, OH. No Carltons have ever been identified. The kit house from Harris Brothers, No. 152D, that SDR linked to is located at 312 13th Street in Pleasanton, KS. Sorry, one more thing... if you're interested to know some of the architects who designed the standard Sears house plans, here is what I compiled. Some big names on that list! I found this small picture in my files, and can't remember where I found it. I wonder if that band of six sash on the second floor is shared by two or more rooms -- as Wright might have done. And I wonder if the copyist and the manufacturer would have taken any counsel from Wright's first-floor space allocation . . . The area is a ghetto now, it seems unlikely that the one on the left will be saved. The one on the right appears to be mostly just a foursquare with a dressed up front elevation and some nice fenestration. It seems probable to me that these are both pattern book houses. Interesting. The one on the right is a curiosity -- a Prairie foursquare with a Craftsman bungalow porch ? The trim details fit both types, illustrating what Wright would never countenance, namely the affinity of the two strains. The house on the left is even more unusual, isn't it; would anyone have committed that combination of first-floor openings to paper, in a catalog ? What would they have called it ? As to the pair, is it only in America that we have these cheek-by-jowl juxtapositions of styles ? San Francisco is a virtual riot of like variety. For lack of a better term, I call the one on the left "Gothic Prairie", it seems to borrow some detail elements from church design. I can't imagine that an architect would have committed either of these mishmash designs to paper as seen here, from which I speculate that perhaps the builder started with published plans and then improvised. I suspect. The window muntin pattern, not dissimilar to ones used by Wright and by W B Griffin, also bridges the Craftsman/Prairie divide ? Ecclesiastical, yes -- but maybe not Gothic ? The round arch and the brick-masonry suggest Romanesque to me . . .
Have you ever found floor plans the the two Sears VanBergen houses? They are not in the book on Sears houses that I have. 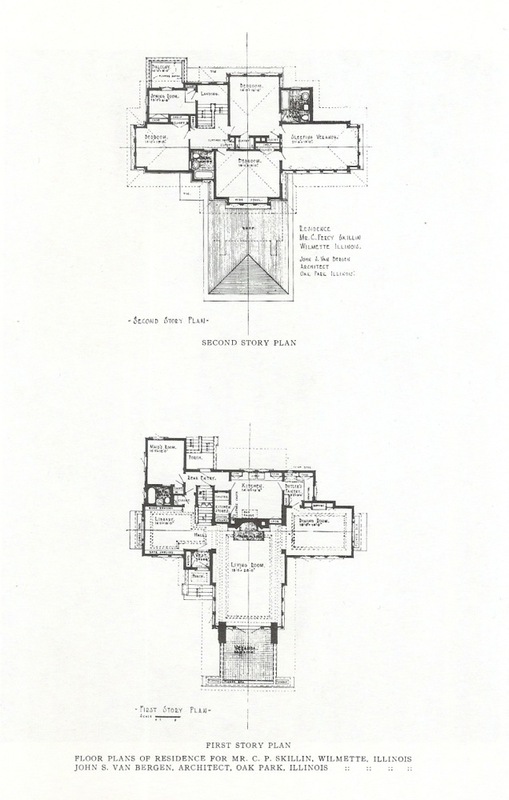 Paul, the Van Bergen Skillen House plan is published in H. Allen Brooks' "Prairie School Architecture." page 258.